Hundreds of questions struck your mind every day and most of them ends up with no answer. Well, we are not talking about the question related to your personal life. We are covering some curious and interesting questions along with fascinating answers that might amaze you. The answers are based on science and general facts. So let’s begin our virtual question answer session and find out how smart you actually are. 13. What’s the Color of Mirror? Explanation: Human can differentiate 10 million different colors but it’s hard to image the mirror is not white or silver. It is actually the color of whatever is reflected onto it. The perfect mirror reflects all images in the exact opposite direction (angle of reflection) and distance. So the color of the mirror would be kind of smart white. But, we live in a real world where there is no perfect mirror. Every real mirror absorbs a very tiny amount of light. In particular, it best reflects light within the 510 nanometer range, which is the spectrum of visible green light. So technically, your mirror is titchy green. 12. How Much Percent of Brain We Use? Explanation: It has been misattributed to many people (including Albert Einstein) that we only use 10% of our brain. This myth was originated in the 1890’s by the father of American psychology, William James. He said “most of us do not meet our mental potential” and this misunderstanding stuck for a long time. The truth is, we use virtually every part of the brain and most of the part is active all the time. In fact, during sleep, all parts of your brain remain active. Although, it is true that every part of the brain is not concurrently active at any given moment. For maximum efficiency and in order to be conscious at all, 1 to 16% of the cell should be active. Furthermore, most of the cells are used to control unconscious activities such as heart rate, dreaming etc. The human brain requires 20% (more than any other organ) of the body’s energy, in children that figure is 50% and in infants, it is 60%. It contains more neurons (around 86 billion) than any other species and this dense neuron packing is what makes us so smart. 11. Where Do Permanently Deleted Files Go in Computers? Short Answer: Nowhere, it is still there. Explanation: Do they just wiped out, do they go off somewhere where you can never get them back or do they send it to the Obama so he can see them:) Well, the answer is your computer doesn’t delete anything, they are right there in your hard disk. When you delete a file you just change a pointer to new address on your hard disk. Pointers are a special type of data that points to the location (Track/Cylinder/Sector of hard drive) where the actual file is stored. Large files are usually stored in multiple locations. When you open a file, the hard drive follows the pointer to present the data. The file is never erased, it is present physically on your hard disk. But the address where file is located is made available for the next read/write operation. You can get those files back using special software, unless the location has been overwritten. Although, overwriting doesn’t guarantee that your files are gone forever. Organized criminals in Ghana have managed to recover confidential data from dumped electronic wastes. So if you are working for any secret agency, it’s better to destroy your hard disk rather than throwing it away. 10. What is the Resolution of the Human Eye? Explanation: The Digital images are made of millions of tiny tiles-like elements. The more these tiny elements (called pixels), the more will be the resolution. A single mega pixel is equivalent to one million pixels in an image. If you know width and height of an image you can calculate how many pixels your camera gets (by simply multiply them). Also, the megapixels have nothing to do with the quality of image. Quality depends on exposure, focus, lighting, camera lens etc. 9. Does Sunlight weigh anything? Explanation: Sun’s light composed of photons reaching the earth definitely has equivalent mass. That’s the reason the area covered in shadow weighs less than the area being pushed by light. Especially, the sunlight emitted in a day would be around 3.7*1024 kg. If you collect all the sunlight in a perfect mirror box, the mass of the box would increase by that amount (because of the photon energy). Furthermore, freely streaming mass-less protons are deflected by gravitational fields. Fun fact: On a sunny day, Chicago weighs 140 kilograms more, simply because sunlight is falling on it. 8. Where is the Center of Universe? Explanation: The universe started with a “Big Bang” about 13.7 billion years ago and it has been expanding ever since. The center of this expansion is everywhere. No matter where you are in the universe, everything will seem to be expanding or moving away from you at the same rate. Now you may ask, aren’t we located at some point with respect to the universe? Well, we certainly are. If you have powerful telescope that could see all the way to the end of the universe, would you find more universe on one side of earth than the other? No, it looks the same in all directions. That doesn’t mean earth is the center. Read: What Would Happen If Earth Loses The Moon Sooner? Let’s take the universe as balloon which is being inflated with air. Imagine yourself as one of the many dots on a spherical balloon. The other dots will be getting away from you as balloon gets bigger. In fact, every dot is getting farther from each other at the same rate. No matter what dot you represent, it looks as you are at the center of the expanding balloon. The same happens in 3-dimensional space. 7. Which Came First – The Egg or The Chicken? Explanation: The egg laying animals existed way far before the chicken came. So technically, the egg came before the chicken. Let’s take the clock many, many moons ago when there were no chickens. A creature very similar to chicken (let’s call it proto-chicken) would have mated with other proto-chicken. The two organisms pass their genes in the form of DNA. However, the replication of DNA is never 100% accurate and very often produces a tiny change for the new organism. These tiny changes in DNA could create a new species over thousands of generations. The same happened with proto-chickens and the small genetic mutation created the new species called chicken, which grew in egg. 6. What If Everyone on Earth Jumped at Once? Explanation: There are more than 7 billion humans of earth. That means total human weight could be approximately 7*80 billion kg. However, the total mass of the earth is 5.9*1024 kg, which is comparatively way too high. According to Sir Newton, there is always an equal and opposite reaction to every action. So, technically, there will be a tiny impact. If all of us get together at one location and jump 30 cm above ground at the exact same time, we would push earth away from us about 5.3*10-14 meters, which 1/100th of the width of a single hydrogen atom. And when you get back on the ground, the earth would move back to its previous position. 5. 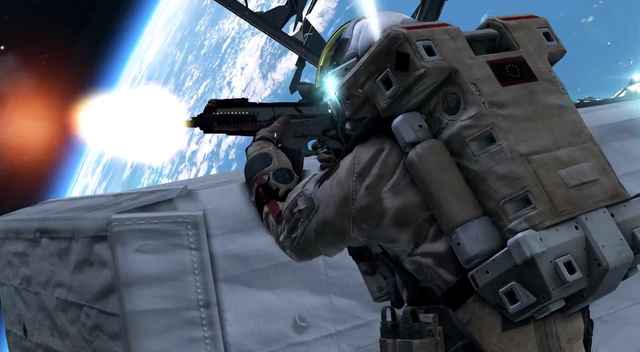 Can You Fire a Gun in Space? Explanation: Guns don’t require oxygen to work so the vacuum of outer space will not a problem. The gunpowder is completely self-contained and doesn’t depend on the atmosphere. The gun will work better in space. The bullet will not have to compress or push the air in the barrel and it can travel infinite distance in space. Because, it is in the space, it will curve eventually. The orbit of the bullet will be different (depending on speed and position of the bullet) from the orbit of the person who fired it. Firing in the straight direction of orbit will result eccentric orbit and because the Universe is expanding continuously (73 kilometer per sec per megaparsec) the bullet will never stop and will travel forever alone. Fun fact: On moon if you fire a powerful gun (of 1,600 m/s bullet speed) at the horizon and then wait a little bit, you can get hit in the back of the head. 4. How Much Money Is There in the World? Explanation: Well, it’s difficult to figure out the accurate number but that amount has a special name and divided into 4 categorizes i.e. M0, M1, M2 and M3. M0: This is the smallest measure of money supply that includes aggregate evolve coins and banknotes. This amount is slightly more than 5 trillion US dollars. This is really huge but it is less than even 10 percent of the total money we humans have available to spend. M1: This includes all physical money, demand deposits, checking account and NOW (negotiable order of withdraw) account. M1 is estimated to be equivalent of 25 trillion US dollars. M2: It’s a broader money classification that includes M1 plus the assets that can’t be cashed quickly for example saving deposits, money market mutual funds etc. M2 is estimated to be equivalent of 60 trillion US dollars. M3: It includes M2 plus institutional money market funds, large time deposits, short term repurchase agreement and more. M3 global money supply is estimated to be equivalent of 75 trillion US dollars. Grab the knowledge: The largest amount of CASH ever burnt on earth is one million pound by K Foundation on 23 August 1994. 3. How much is the Earth Worth? Explanation: Greg Loughman, an astrophysicist at the University of California Santa Cruz has created an equation for calculating the total worth of the planet. The equation includes planet’s size, age, temperature, mass, habitability, their ease of being studied and other crucial factors. This evaluates the Earth’s worth around 3 quadrillion pounds, which came out as the most expensive planet of the universe. Moreover, Mars was valued at 10,000 pounds and Venus worth less than a penny. The History Channel also calculated the total worth of Earth by considering all its resources like water, granite, lumber at current market prices and they came up with a total of 4.4 quadrillion pounds (approx). 2. What If the Earth Stopped Rotating? Short Answer: You will die. Explanation: At the equator the surface of the earth and everything on it, is rotating at 465 meters per second. This speed gradually decreases as you go closer to the pole. As soon as earth stops rotating, everything on the earth (except at the pole) would continue moving as it had been. Your body would fly east at the supersonic speed of 465 meters per second if you’re near the equator. You can only survive at the poles (for a few seconds). There will be giant tsunamis and all water will start moving towards the pole. Half of the earth would be completely exposed to the sun, which would raise the temperature and the other half would freeze. The speed of wind will be faster than the shock wave of atom bomb. It will instantly start fire all around the planet. The iron core in the earth’s center would stop too and thus protective magnetic field would no longer be there. The radioactive rays from the sun would enter on earth and kill everything left. And yes, the most important thing: you would gain weight by 0.3%. 1. Is Time Travel Really Possible? Short Answer: Based on the available theories, you can travel in future. Explanation: Technically, we are already traveling in time at the rate of 1 hour per hour. The actual question is can we travel faster or slower than this rate? It’s already been done. The Russian cosmonaut Sergei Krikalev time traveled into his own future by 0.02 seconds. He spent 803 days, 9 hours, 39 minutes orbiting our planet. Traveling at 17,500 miles per hour he experienced an effect called time dilation. Einstein’s Special relativity theory says that when your travelling speed relative to other objects is close to the speed of light, time goes slower for you than for the people you left behind. That’s the reason clock of GPS satellites disagrees with the clock on earth by seven millionth of a second daily. Suppose you are a 10 year old boy who left Earth in a rocket traveling at 99.5% of the speed of light (impossible to achieve at present) and you return after 5 years at the age of 15. You would find that all of your classmates were 60 years old. Because time passed more slowly for you, your 5 years on space would be equivalent to 50 years on earth. And that’s how you can get ahead 45 years in the future. Einstein’s another theory called General Relativity says that time passes more slowly for object in gravitational field than object far from such field. There are all kinds of time-space distortions near black holes, where the gravity is very intense. Over the past few years, some scientists have used this distortion to find possible ways of traveling in future. Some like the idea of “Worm holes”. But still we don’t know whether they are possible for real objects. Traveling into the future or near to the speed of light would consume an extraordinary amount of energy. Whereas, time travel to the past is pretty much impossible. We do not understand the science as well and still exploring. All the facts that you mentioned above are amazing. You won’t believe you had solved my more than 6 questions that I wished to figure out when I was in class 5. And luckily when I stumbled upon this, I was amazed to find out all those questions with answers where waiting for me. Hello Priyanshu, glad you asked that question. I believe this will clear your doubt. all questions amazing….i like it lost and this one good for study.